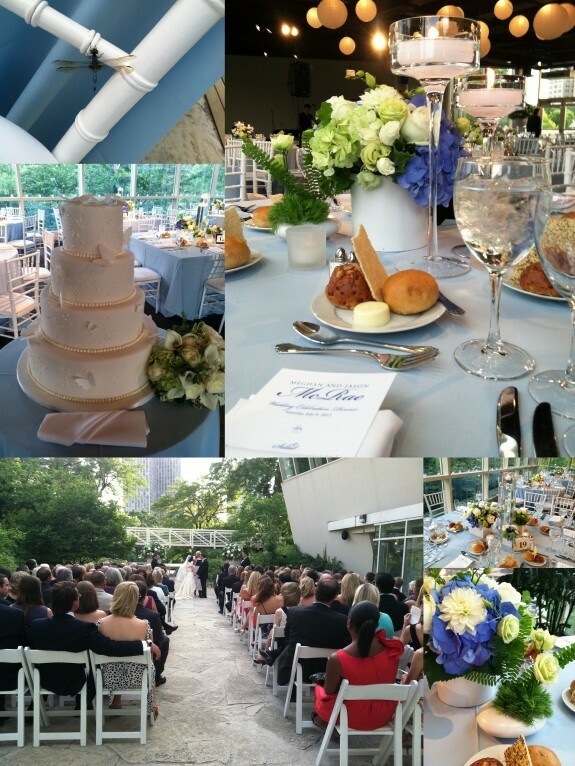 Congratulations Mr and Mrs McRae – married 7.9.11! We always love working with Lindsey, Natasha and Mary on weddings at the Peggy Notebaert Nature Museum – and this past weekend was no exception! Perfect weather compliments of Mother Nature set the stage for Meghan and Jason’s vision come to life by Amy of Blumen – a very “preppy hip” Nantucket vibe that blended perfectly with the natural background and time of year. We even had a tiny winged gate-crasher – this lovely little dragonfly matched perfectly with the decor! I love seeing how each bride puts their individual stamp on this space. I think my favorite part of the evening was when they were introduced for the first time as husband and wife at the end of the ceremony and a bagpiper came out onto the bridge behind the altar and played them into the reception!